In all likelihood, you're being denied a credit limit increase because you're a risk for the bank. Maybe your credit utilization ratio, which measures how much of your available credit you have already spent, is tipping too far into the no-no zone. Or perhaps you've been inconsistent with payments — and if that's the case, why should they invest even more money in you? It's nothing personal, of course; business is business. But now you have to prove to the creditor that you're serious about managing your money in a responsible and timely manner. "Talk to the issuer to determine the reason for the denial and then work to make improvements, which would likely include paying down a portion of your balance," says Chantel Bonneau, a leading financial adviser for Northwestern Mutual. "Also, overall, a good rule of thumb is to ask for increased credit when you don't need it, not when you do." Plus, some lenders just have rules. For example, certain card companies will only increase credit once per year. Others will automatically reject a credit limit increase if you've had any late payments in the last 6 months. If you get denied and have no idea why, ask. With the right information, you can proactively work on reversing the decision. You typically won't be denied a credit increase if you have enough money in the bank to justify a creditor taking the risk of lending you more. Show that you're serious about getting on the right track by cutting back on your overall spending. "I recommend sitting down and looking at the areas where you spend more money than you really ought to," say Natasha Rachel Smith, personal finance expert at TopCashback.com. "If you notice a pattern, consider cutting back or looking for a cheaper alternative. Cut down on spending and put more toward paying down debt or toward your savings." If you feel like you're on top of your credit cards and consumer debt, and don't quite understand why you've been denied the increase, maybe there are other factors at work that you're unaware of. Order your free annual credit reports from the three major credit bureaus via AnnualCreditReport.com to start investigating any potential errors or inaccuracies. Do you have late bills or other negative marks? If so, are they accurate? Does any activity appear fraudulent or unauthorized? What is your ratio of outstanding debt to income? If you've been denied a credit limit increase, you'll usually receive a response explaining why you didn't get approved. Read over the explanation and take the necessary steps to fix the issues. "Whether your credit score is too low or you're utilizing 30 percent or more of your credit line, you need to fix the issues before requesting a new credit limit increase," Smith explains. "Be mindful that some banks might require that you wait a few weeks or months before requesting a limit hike, while others will let you make a new request at any time. Make sure to call your bank's customer service to ask about anything you're unsure about before trying again." If you used an automated process to request the increase online, your next step is to talk to a human being and ask for one. (After screaming, "Representative!" into the phone a few times during the automated tutorial, of course.) This way, you can explain your situation over the phone and tell them why you need a limit increase. You may not get a better outcome, but it can't hurt to try. If you have multiple cards and you're better at paying down one more than another (hopefully the one with the highest interest), that's the card on which you should pursue the increase. If that's doesn't work, try another card. Maybe you don't have as much debt on that card, which could increase your chances of getting what you want. Keep all interest rates in mind, however — especially if you're making a big purchase that you may not be able to pay off quickly. You don't want to screw yourself in interest charges that'll leave you worse off than you were before. Being denied a credit limit increase could be the perfect time to ask for a raise. Has it been awhile since your last one? Are you overdue? Do you think your performance warrants a raise? It never hurts to ask. The more income you report, the more the credit issuer will favor you. 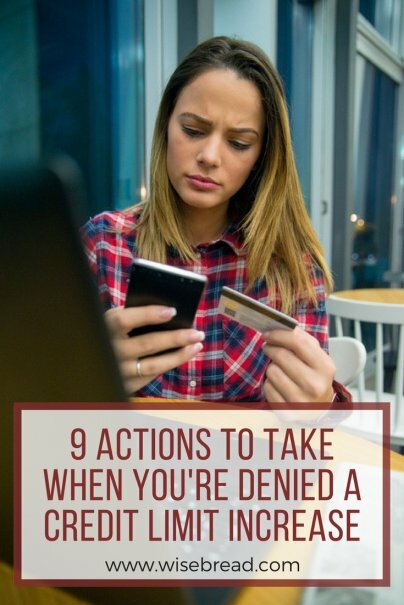 If you've been denied a credit limit increase due to your bad credit, it's unlikely you'll be approved for another credit card. But maybe you got denied because you made one late payment two months ago, in an otherwise stellar payment history. If that's the case, and you're ready for a big purchase, you might be approved for a new credit card that offers a 0% intro APR on purchases during a promotional period. That gives the added benefit of some interest free time to pay off that big purchase.